History repeats itself, because no one was listening the first time. Yet it is not just history, and the non-fiction books which document it, that should serve as a warning to all of humanity about where we have been and where we are headed. There is plenty to be learned from classic literature and fiction novels as well. And although most fiction is meant to entertain us, there is plenty of literature out there that either literally or allegorically shames us for where we have been, or tries to warn us about where we are headed. My personal favorite example of this type of cautionary fiction is the “dystopian future” literature. Not the apocalyptic or zombie variety, but rather the “oppressive, all-powerful, totalitarian-authoritarian government” kind. Famous works of literature such as Zamyatin’s “We”, Huxley’s “Brave New World”, Orwell’s “1984”, and Rand’s “Anthem”, were all written to serve as blatantly obvious warnings about a very real and possible not-so-distant future, in which man is dominated by the state and individuality is destroyed in favor of collectivism, often in the name of creating a false utopia. The problem is, that so many damn people miss this obvious point. 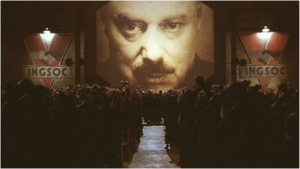 Many of these dystopian books are read and taught in high school. Or at least they were in my day, god only knows what kinds of idiotic dumbed down crap the modern public schools are “teaching” today. But I digress. During my high school years, I recall reading such books as “Fahrenheit 451”, “Animal Farm”, “Anthem”, and of course “1984”. Therefore, my point is that these books are generally not unheard of. They are not obscure. Many are in fact well known and highly regarded works of literature, with a large segment of the population having read at least some of them. Furthermore, these books should be especially well known and well read among the so-called educated, enlightened, academic, pseudo-intellectual progressive crowd. Yet even if we dumb it down a notch, we can still look at some of the wildly popular tween book franchises—such as “The Hunger Games” or “Divergent”—which share many similar themes with the classics, and also have a widespread young readership. So therefore, its not as if these themes are not out in the public mind. Hell, let’s dumb it down a notch further to the absolute lowest common denominator and infer that even if the illiterate dregs of society have never read any of these books at all, than they must have at least seen a movie version of one of these books. Even barring that, let’s infer that they must have at least seen some movie with similar themes or plots at some point during their lives. Therefore, it is not like these themes and warnings to humanity have not been dispersed to a wide audience in one form of media or another. Again, the problem is that so many ignorant people out there are completely oblivious to this message and warning, or they miss the obvious point entirely. I suppose that most average people out there, assuming that they are even capable of comprehending the themes in these types of stories, see them as nothing more than fiction and entertainment value. They hold the naive assumption that it could never happen here or to them. They foolishly believe that our society could never actually end up that way, and that the “status quo” will always remain, all the while mindlessly voting and advocating for the very people and policies that are contributing to the erosion of individual liberty and rights, while strengthening the central authoritarian power of the state. This mindless and naive idealistic populism, while generally oblivious to the consequences, is always in the name and false promise of creating an egalitarian utopia. This sheer lack of connection is mind blowing, but it is not at all surprising. The other category of people who are completely oblivious to this reality are the so-called intelligent “useful idiots”, who actually claim to understand the point and lessons of this dystopian literature. These so-called “enlightened intellectuals” will proudly brag about how well read and educated they are, while proudly admitting to reading many of these books, yet they still completely miss the point. Oh they will absolutely acknowledge with a straight face the dangerous themes and warnings within these books, yet they will always point the finger at the “other side”. They will always attribute the road to oppression with the laws and policies of the opposite side, never once looking in the mirror to see that they are cheering for their own demise. The progressive liberal left will blame those on the conservative right. They will blatantly call them fascists, nationalists, xenophobic racists, and Nazis, who are hell bent on enacting some kind of fascist, corporatist, authoritarian, police state. They are completely oblivious, unconcerned, or complicit in that their own progressive-socialist, Marxist, authoritarian, and social justice utopian policies will erode freedom, individualism, and individual rights just the same, all while granting limitless power to the state. Those on the establishment right will blame the left all the same, calling them socialists, Marxist communists, and progressives, hell bent on enacting an all-powerful, centrally-planned economy and government. They too are oblivious, unconcerned, or complicit that their own neo-con, big government, corporatist, and progressive right policies serve only to empower the state as well, at the expense of the individual. This is therefore a complete and utter lack of understanding by many that two roads can very well lead to the same place. There are many roads to hell, and all of them paved with good intentions—or at least they are sold that way. It is also a failure to think critically, and to delve deep into the dangers of one’s own belief system and ideology. Just because someone happens to agree with the policies of their own side, doesn’t make those policies any less potentially dangerous. Utopia means very different things to different people. Yet its even simpler than that. Many people just simply do not comprehend that there are those out there who seek power purely for the sake of power. They do not seek power for benevolence, or altruism, or to be good leaders; they seek power purely for the sake of raw power and to rule over others. These such people will strategically wrap themselves in any ideology or flag that they feel will best help them in achieving this end. All while the ignorant and “educated” masses obliviously cheer them on. Far too few understand this. Those who fail to learn history are doomed to repeat it. Millions of people in this world have been killed in the name of creating “utopia”. Millions still live under the boot of oppression, whatever the name of that oppression may be. Whether history, non-fiction, or literature, the lessons and warnings are blatantly clear to those willing to heed them. This entry was posted in Literature. Bookmark the permalink. Follow any comments here with the RSS feed for this post. Both comments and trackbacks are currently closed.